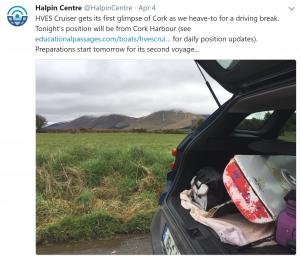 On April 3-4, 2018, the HVES Cruiser was transported from County Mayo in the northwest of Ireland to Cork on the south coast with travel updates brought to you by @HalpinCentre on Twitter (see pictures). It will undergo repairs under the direction of Cormac Gebruers, Head of Research at the National Maritime College of Ireland, in Ringaskiddy, County Cork. 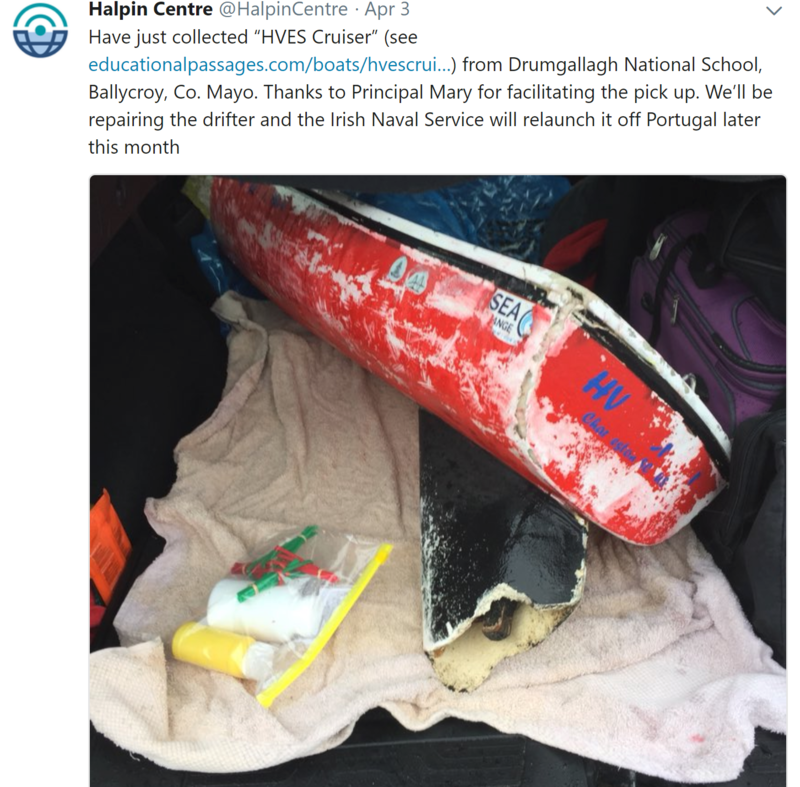 Once repairs are completed, it is expected that the HVES Cruiser will be set to sea off the coast of Portugal by an Irish Naval Services vessel on a scheduled deployment to the Mediterranean Sea in mid-April, 2018. Thanks to miniboat enthusiast Mike Mcglynn, it was decided to set the HVES Cruiser on a second voyage! To accomplish that, the boat needs some repairs to damage done when it came ashore. Congratulations to the Harbor View Elementary School which was deemed the “Cool School of the Week” from WCBD News 2. 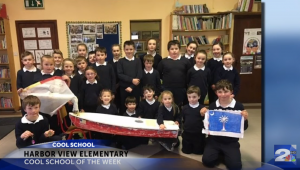 The school and its miniboat were also featured in this news clip, check it out! 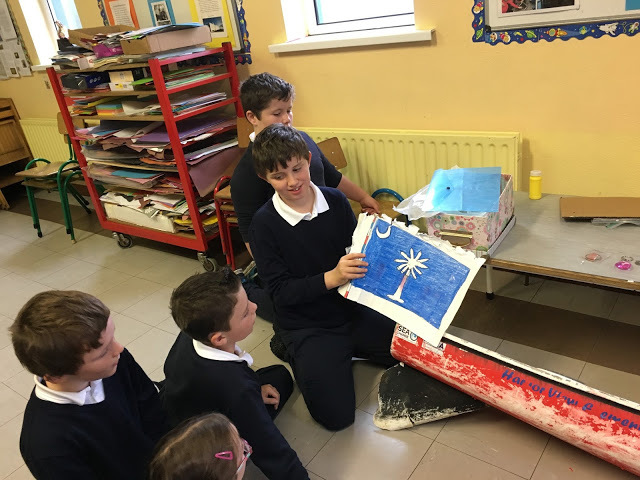 On the 12th of October a small sailing vessel “The Harbour View Elementary School Cruiser” from Charleston on the south-east coast of the U.S.A was discovered on the shores of Fahy in Ballycroy. The boat is approximately one metre long with a small sail and arrived in great condition, despite the treacherous sea journey across the Atlantic Ocean as she travelled the Gulf Stream. Research on the internet indicated that the U.S. Coast Guard helped launch the boat on May 10th 2017. It had spent 154 days and 12 hours at sea. The boat had a GPS tracking system that followed its progress. 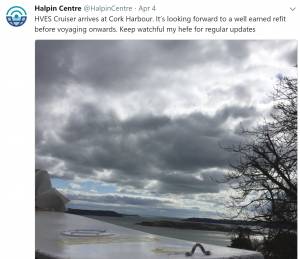 Several months later, in early October as landfall looked eminent, emails were exchanged with our colleagues in Ireland. On the morning of 11 October 2017, we saw she was apparently reporting from the shore of a remote island of “Duvilluan More”. 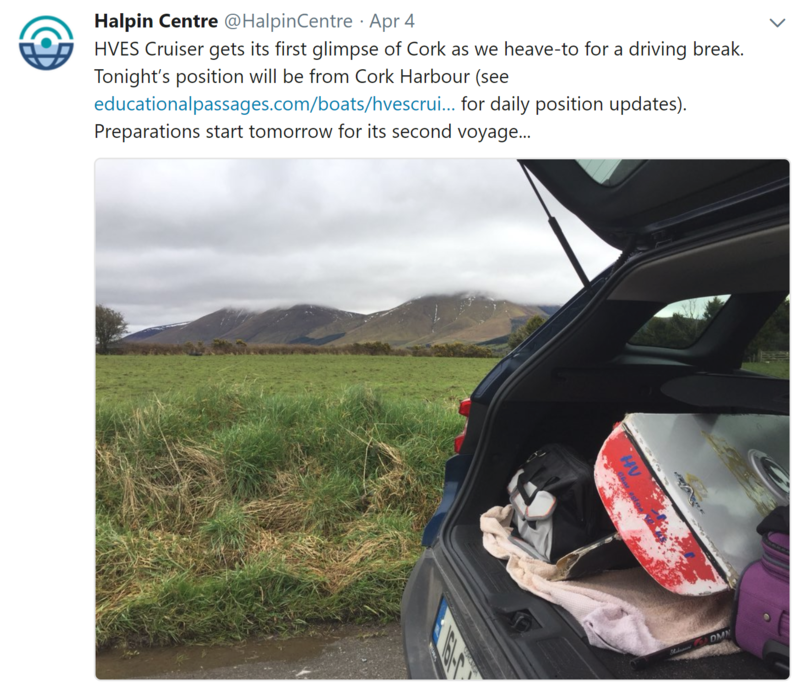 With only one or two buildings on this rocky island, it seemed likely the story was over but later that same day, she reported underway and on route to the mainland and, the following morning of 12 October, she was reporting from a sandy beach in a sparsely populated area of Ballycroy! Later in the day, we saw she was several miles inland heading up Highway N59 and then, a few days later, started reporting from what appears to be a school! We thought it might be the Drumgallagh National and, sure enough, we got the email on 16 Oct saying: “Hi all in Charleston. 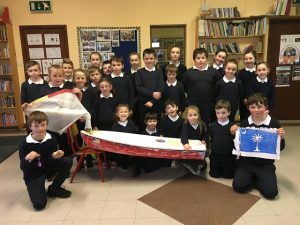 We just want to let you know that your HVES Cruiser has arrived safely in Ballycroy and we have examined the contents in our school today. All of the children are extremely excited. Best Regards Mary calvey. School Principal”. A few months later, near the end of July as she approached the southeast corner of Newfoundland Canada, emails were exchanged with our miniboat colleagues in that area but she sailed on by. 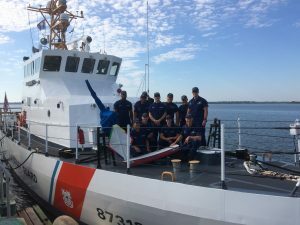 The US Coast Guard helped launch HVES Cruiser. According to Capt. 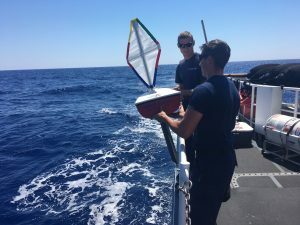 Tom O’Brian it was “a nice south westerly wind of 10 knots and 2-3 foot seas” on May 10, 2017. 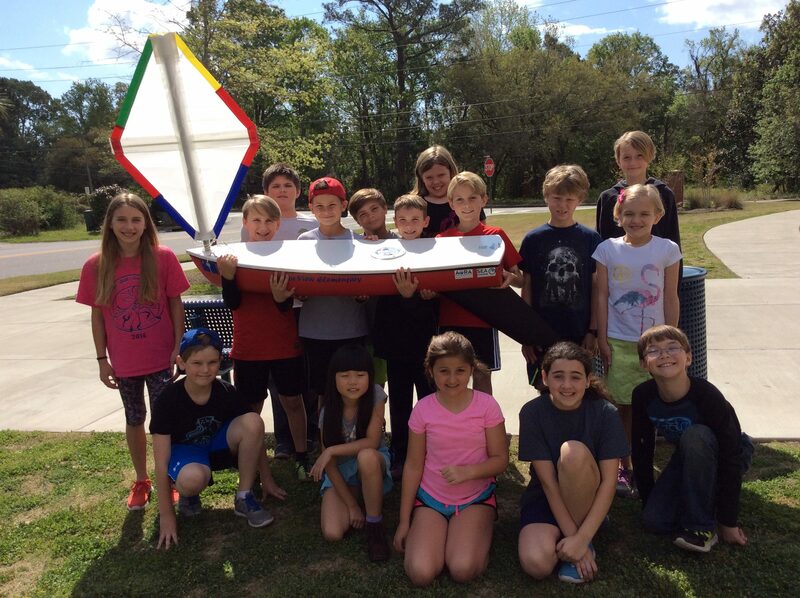 Harbor View Elementary School then watched the vessel as she traveled the Gulf Stream.